Several factors interact to produce the climate and weather of South Africa (for good overviews see Tyson, 1986; Mason and Jury, 1997; Lindesay, 1998; Tyson and Preston-Whyte, 2000). The physical location of the country in the subtropics shapes climate and weather (Fig. 1). The local orography and landscape features of the country (most of the country is situated on a plateau approximately 1500 m above mean sea level) and sea surface temperatures (SSTs) of the cooler Atlantic and warmer Indian Ocean also modulate and influence local weather and climate. Figure I Some important features and controls of the atmospheric circulation over southern Africa (modified after Tyson and Presto 11-Why te, 2000. with kind permission. Oxford University Press, Cape Town). The subtropical high-pressure belt (e.g., the South Atlantic High and the South Indian Anticyclone) is usually associated with dry, stable atmospheric conditions that can prevail over much of the country for several days of the year (Tyson and Preston-Whyte, 2000). Tropical easterlies also affect southern Africa throughout the year (Tyson and Presto n-Why te, 2000). Sources of atmospheric moisture from the warmer tropical regions interact with colder drier air from the southwest to provide the setting for weather producing systems. The interaction between warm, moist easterly air and drier, colder westerly air produce convergence zones, cloud bands, and rainy spells for days across the country. The variation and location of these cloud-band convergence zones over the southern Africa-Indian sector in summer has important implications for rainfall over the country (Tyson and Preston-Whvte. 2000; Harrison. 1984a). Wider-scale interactions between oceans (sea surface temperatures) and the atmosphere also influence the variability of rainfall (Jury, 1995: Jury et al., 1996; Mason and Jury, 1997), both locally and on a larger scale. Changes in the sea surface temperatures that are linked to atmospheric pressure fields and circulation have been shown to influence local weather and climate (Tyson and Preston-Whyte, 2000). Wanner and colder phases of water in the Pacific Ocean, for example, may influence the climate of the country by enhancing or suppressing local circulation systems. As will be shown below, these changes in circulation can become pronounced (e.g., during an El Nino or La Nina) and can produce periods of extremes in temperature and rainfall over the country (Lindesay, 1998). 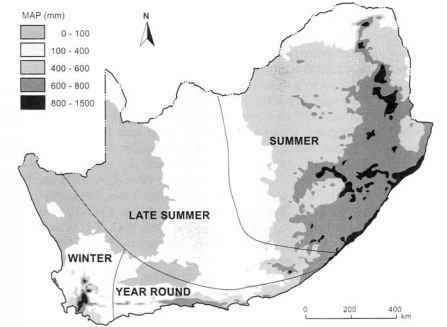 Figure 2 Spatial distribution of mean annual rainfall in South Africa (after Fox and Rowntrec, 2000, with kind permission, Oxford University Press, Cape Town). progresses eastward (Fig. 2). The surface aridity of much of the country is a function of the variability of the rainfall"' as well as the relationship between evaporation and precipitation (Lmdesay, 1998; Tyson, 1986). Evaporation usually exceeds precipitation over almost all of southern Africa with the deficit being greatest in the west, particularly in western South Africa and neighboring Namibia and Botswana. As a consequence of the topography and rainfall distribution, the natural availability of water is very unevenly distributed across the country with more than 60% of the flow arising from only 20% of the land area (Department of Water Affairs and Forestiy. 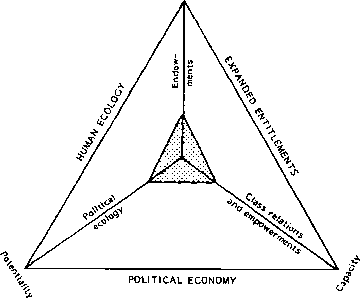 1997: Schulze et al., 2001). Large bulk water transfer schemes have been established to ensure water supply from these wetter to drier areas (Abrams, 1997). 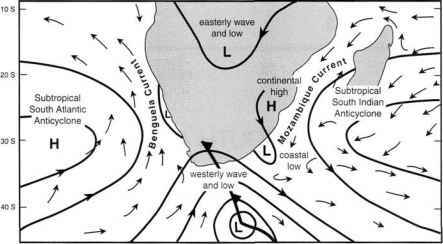 How the three anticyclonic circulations affect the climate of southern Africa? How does the anticyclonic air circulation around south Africa influence the weather and climate?